Most DSLR and SLR cameras can be triggered remotely using a release cable. Unfortunately the connectors used for the external release have rather exotic shapes. Below you will find the pinouts for the common camera types. The standard solution consists of three wires: ground, focus and shutter. To focus the camera the focus wire has to be connected to ground. To release the camera both wires have to be connected to ground. All Canon EOS cameras are equipped with a remote release connector. There are two types of plugs. Refer to this article for more details on the electrical data of the external trigger ports. Most types can be released by pulling down just the shutter wire. The 60D is the first two digit camera using a jack plug. It's is a DIY friendly stereo (3 pole) 2.5 mm jack plug. It is not the standard plug used in mp3-players etc. which has a diameter of 3.5 mm! But don't worry, you can buy this smaller plug in a bigger electronics store. The 'official' remote controller with this plug sold by Canon is called RS-60 E3. 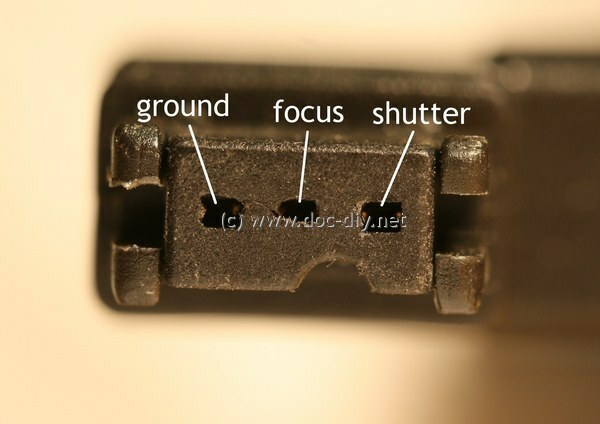 This connector is used with the EOS 10D, 20D, 30D, 40D, 50D, 5D, 5Dmk2, 5Dmk3, 5Dmk4, 5DS, 6D, 7D, 7Dmk2 and all types of the 1D. The only way to get the connector is canibalising a cheap remote control. The 'official' remote controller with this plug sold by Canon is called RS-60 N3. 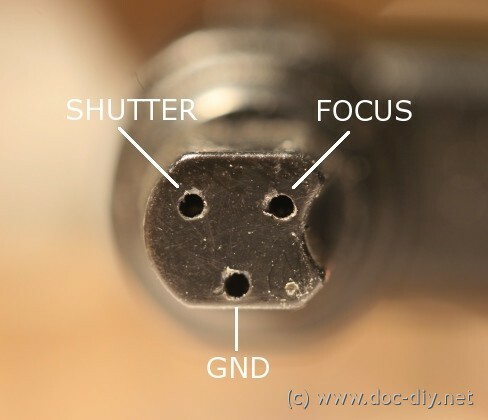 Fuji has currently three types of wired shutter release connectors. X-T1, X-T10, X-T20, X-E1, X-E2. Cameras specified to work with the Fuijfilm RR-80 remote control can be controlled using a miniUSB plug and some additional circuitry. The male miniUSB plug is offered by bigger electronic component vendors. 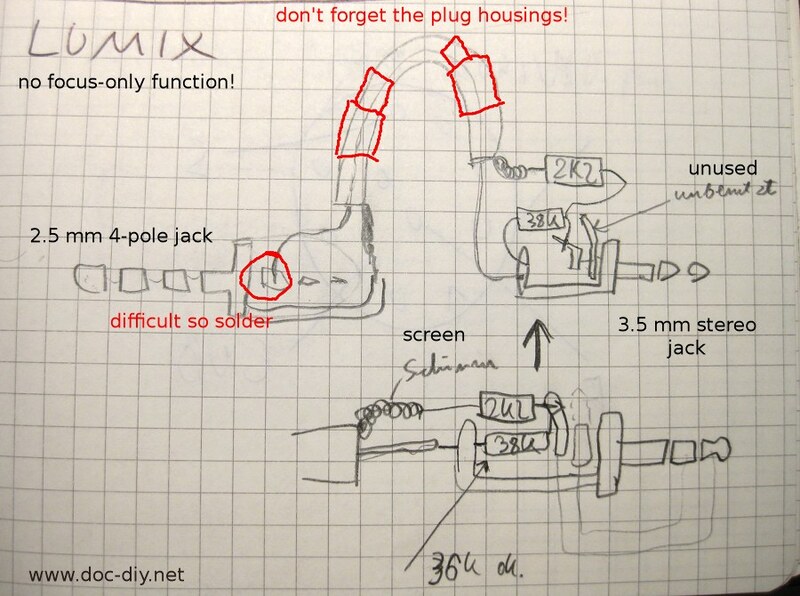 The images below show the wiring of an adapter cable to the standard jack plug as needed by the SmaTrig for example. the cable. Hasselblad uses the same 2.5mm stereo jack connector as Pentax and the smaller Canons. It fits the H, H1 H1D, H2, H2D, H3D. With three different types, Nikon is the unbeaten leader in inventing remote release connectors. This type fits the D70s (not D70!) and D80. This type fits the D90, D3100, D3200, D3300, D5000, D5100, D5200, D5300, D5500, D7000, D7100, D7200, D600, D610, D750 and DF. It was introduced to connect the GPS-receiver. The D90 was the first cam to appear with this new connector. 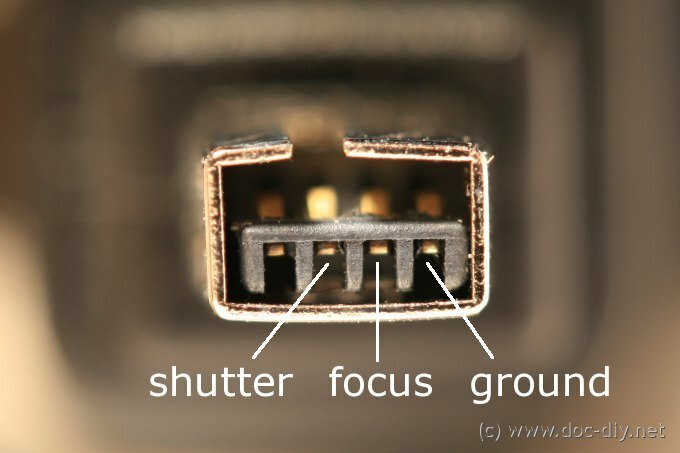 This is the connector found in the bigger Nikon cameras like D200, D300, D500, D700, D800, D800E, D810, D850, D3, D3x, D4, D5, etc. Several analog cameras like the F100 use this connector too. It is also used by the Fuij S3 and S5 Pro. Nikon offers a cable called MC-22. It's an adapter cable for the round 10 pin plug ending with three banana connectors for own circuitry. Unfortunately the models D40 (2006), D50 (2005), D60 (2008), D70 (without s) and D3000 don't have a cable release connector. IR or USB-tethering are the only control options here. OM-D E-M1, E-M5, EM10, etc. XZ-1, SZ-20, SZ-30 MR, SP-565, SP-570 and SP-590. With the OM-D E-M1 Mark 2 Olympus is switching to the simple 2.5 mm jack connector also used by Canon or Pentax (Thanks for the info Eric!). The corresponding remote control is called RM-CB2. The plug shown above can be found on the older Olympus RM-CB1 remote release. Compatible camera models are E-1, E-3, E-300 (via battery holder), E-10 and E-20. Panasonic/Lumix goes an unusual way and uses just one wire to control the focus and the shutter. As shown in the picture above, only the shaft and the first ring are used. Resistors are used to choose the function. FZ25, FZ30, FZ50, FZ100, FZ150, FZ200, FZ1000, etc. My experiments showed that the more common resistor values of 33k, 3k3 and 2k2 also work. 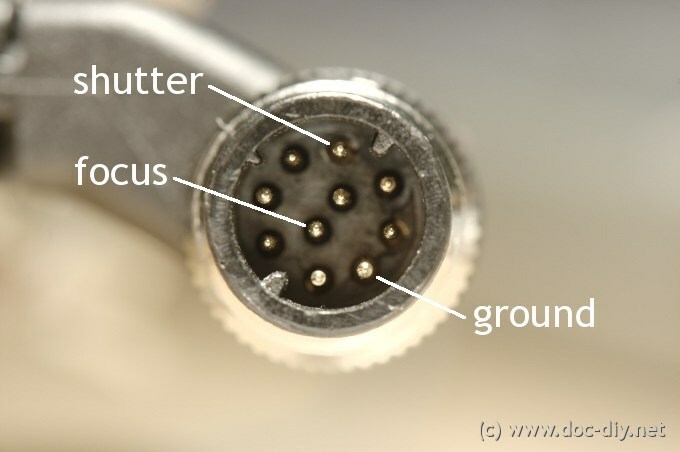 A possible wiring of the cable is shown here. Note that the grounds of the plugs are not directly connected. 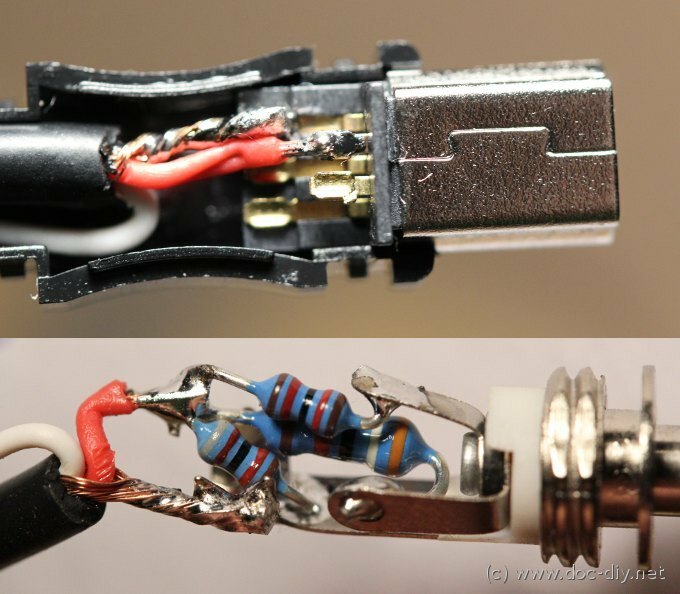 If you are building the cable yourself, I recommend to recycle the 2.5mm side from a ready made cable to avoid buying and soldering the 2.5mm 4 pole plug. Some of the Lumix cameras (e.g. G3, G6, FZ1000) have the remote plug on the right side. This is not typical and a longer cable will be needed. Pentax are the good guys and use the common 2.5-mm stereo jack plug. The pinout is the same as for Canon cameras (see above). These models can be connected using the jack plug: 645Z, 645D, K-5, K-5II, K-7, K-50, K-500, K-30, K20D, K-m, K10D, K100D and K110D. Unfortunately the K-r and the K-x have no remote control socket. These models can be released per IR only. Pentax standard wired remote shutter release is called CS-205. 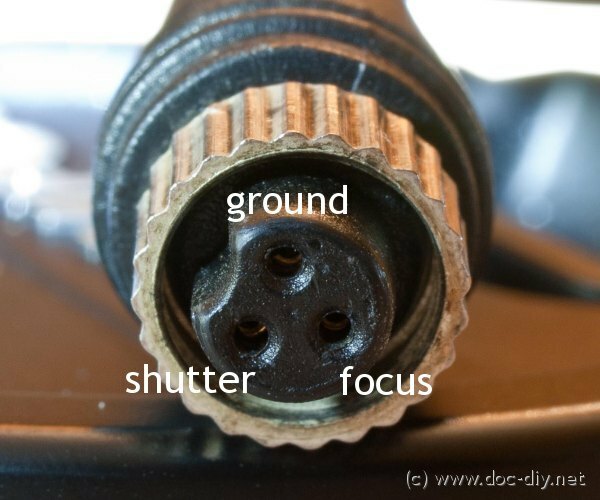 The plug is the same like Canon, but the shutter and focus pinout is swapped. Thanks to sigma_fan for providing the info! Sony has currently two types of connectors. In the bigger models Sony uses the old Minolta connector shown below. The A77ii proved also to work with this cable. 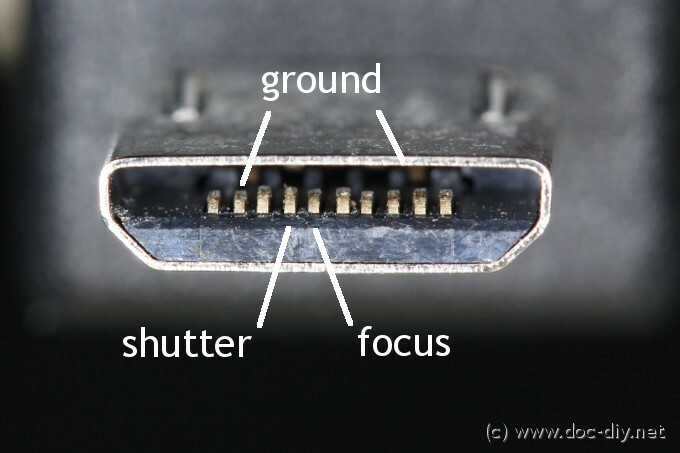 The newer and more compact camera models use a connector similar to a micro-USB port but equipped with an additional row of contacts for extended functionality. In the image below you can see the front row and the standard USB contacts with a larger pitch in the background. The plug is about 3 mm longer than the standard micro-USB. Sony uses the same trick for their Multi interface shoe to make their own equipment and older flashes compatible. In the plug I analysed the ground was on the metal housing. Other sources specify the second pin as ground. The other pins have other functions like zooming, but need a special protocol. Several Sony models do not have a remote connector and can be controlled only with a wireless remote. No guarantee for nothing. Please be careful when experimenting with your camera. that's interesting. I don't have the information yet. The Multiport was a mix of Micro-USB and Sony's own plug. The USB-C seems to be too packed for such kind of tricks. Maybe you can compare the RC plug to a regular USB-C plug visually. I guess the plug is standard, but some resistors are used to code the functions, like with Lumix. Any feedback is of course welcome. I would like to try out the Smatrig with the very new Sonys. I have a Sony A7 iii and I have just ordered a remote control from China. I see this RC uses the USB-C connector. How is this wired, do I need to apply some voltage to make the camera take pictures? I was thinking of building mine own control using an Arduino. for nex c3 can you identify the id resistor in mini usb ???? I noticed your wonderful SmaTrig2 on the net and wondered if you could address a related question. The Sony UMC-S3CA is a network camera in which the menu can only be controlled via the wired multi-terminal. The camera has no IR remote receiver or wi-fi capability. Therefore, the IR signal of a Sony Wireless Remote Commander (https://www.bhphotovideo.com/c/product/916138-REG/sony_rmtdslr2_wireless_remote_commander.html?ap=y&gclid=EAIaIQobChMI36zBi5a23AIVD4N-Ch2uyAr3EAQYBCABEgJl7fD_BwE&smp=y) won’t control the functions or the menu of the SC3A. Do you think it may be possible to purchase or build a device that converts the IR signals of the Remote Commander to electrical signals for wired remote operation through the multi-terminal? I\\\'m trying to diy a remote shutter cable for a GH4 equipped motion controlled time lapse rail but I am struggling to find a pin out to achieve the claims of the item in the link below.. It would seem that more is going on than the three resistor setup you describe above, however, despite there being a few remotes offering the extended functionality, I can\\\'t find any other wieing diagrams or pinouts. Seeing as your site is so good.. i thought id reach out in the hope that youd be interested in improving your page. So I need to make a connection between Fujifilm XE2s and an RCA / phono lead. From the equipment manufacturer I have the pinout configuration / connection for the RCA / phono lead. I sort of understand the pinouts shown at the top of this forum post. What I need to be able to do is to get the Fujifilm XE2s to fire the shutter. So I guess I buy a RCA lead and a USB micro lead and then cut and connect ------- or do I need to buy anything else AND more importantly what's the connection configuration where I join the cables? The website is great! congratulations for your inspiring work. I wonder if there is any detailed list of compact cameras that support external shutter control. I am thinking about Sony, Lumix and Canon below 400 Euro. First I want to say thank you for posting this great document. 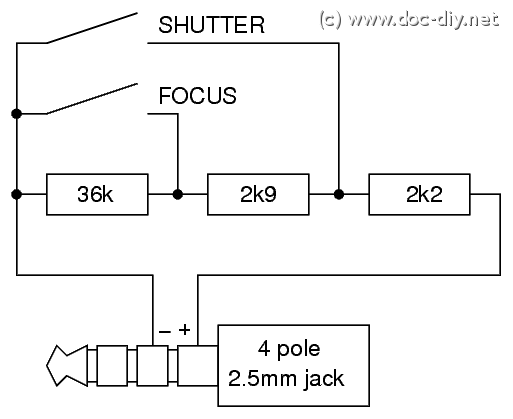 I have read all of it and I like to know that using the different Cabled for different cameras do I need to connect the Shutter wire with the focus wire and then when it is shorted it will focus and then release the shutter and take the picture. I understand that some may need battery or resistor so I am not talking about those cameras. I am new with cameras so please forgive me if I ask some questions that might be simple to you or others. My purpose of doing this is to make a automated picture taking wireless but I need to make the cables first, yes I understand there are many wireless in the market but I am using Arduino which will send signal at certain time and events for the camera to take the picture and I need the make the cables for my receiver to connect to the camera. I tried to just have the shutter cable connected to ground but nothing happens however when I connected the shutter and the focus wires together and then grounded them the picture was taken so my question is DO I HAVE TO CONNECT THE FOCUS AND SHUTTER TOGETHER OR NO NEED. IF NO NEED, THEN IS THERE A SPECIAL SETTING THAT I HAVE TO DO IN THE CAMERA SO BY JUST SHORTING THE SHUTTER WIRE TO GROUND WILL TAKE THE PICTURE. I do want to thank you ahead of time for taking the time to read my email. Thanks for this listing! The next time you edit it, please note that Olympus is now (for the E-M1 Mark II) switching to the same 2.5mm connector that Canon uses for some of their EOS models. Apparently one needs to pull the floating Ring1 (next to sleeve which is GND) to 1.5V for START and to GND for STOP. This voltage can be \'grabbed\' from the tip T (3.3V) and reduced by a simple 100k resistor. The Ring2 (next to tip T) is apparently not used at all? I have not yet tried this solution, but the original author claims success with his LS10 recorder. Hopefully this info will help others as well, because OLYMPUS is not revealing any information about the commonly used remote port, and does NOT offer a simple wire solution as they really should. PLEASE: 4 pin layout used by Olympus RS30W for devices like LS20-M, DM-650/-670 etc? Olympus only offers a wireless IR remote for cam and PCM recorders. The RS30W connects to the controlled device with a simple 2.5mm 4 prong plug. Only START/STOP is controlled this way, and very unreliable (infrared, distance issues etc). With a hefty price tag on top, needs batteries etc, a pure nightmare. There MUST be a way to build a simple pushbutton cable remote for this purpose, allowing for a reliable and cheap way to Start/Stop the device by cable. I do not want to ruin my LS20-M by trial-and-error, as one prong most likely carries voltage for the IR receiver; it may(not) be used for the start/stop signal. Olympus blocks all inquiries, FixYa does not solve it either, can you? with 6k resintance, the opto-coupler is not triggered strong enough and the camera is not responding. Adjust the resistor btw the uC and the opto-coupler for a current of about 20-50 mA. This is the current the IR-LED needs to trigger the output properly. Post a link to the schematic for easier debugging. I made a micro controlled shutter release, consisting of a micor, an optocoupler and a 2.5mm socket for the cable. Here is the weird thing: my program triggers the optocoupler fine and the output pins show that it is reducing the resistance across the output pins from effectively infinity to about 6K. Once in a while this fires the shutter but most of the time not. However, if I have my DMM attached across the socket leads to measure the resistance there, the shutter always fires on command. Is this due to some internal resistance in the DMM, and if so how much should I add to my circuit to have the same effect? I am looking for any info on the rc-200 remote for the olympus stylus film camera. I need to trigger two cameras at the same time and need any information on the protocol the camera is looking for when in remote shutter mode. Any help would be awesome. Panasonic mentions the DMW-RSL1 in the accessory list for the G7, so it should be compatible to all other G-models. Hi, is panasonic remote shuter compatible with model G7 too? They explicitly specify 2.5mm for the remote socket, but 3.5mm for the mic. Are you possibly trying to connect the remote with the mic socket? Do you have this 2.5mm socket in your cam? The Panasonic DMW-RS1 shutter release uses a 2.5mm 4 conductor plug that works on most Panasonic dslr cameras. However the Lumix FZ1000 camera has a 3.5mm receptacle for the shutter release. I have just now ordered an adapter plug with a 3.5mm 4 conductor male and 2.5mm 4 conductor female hoping this will work. With a small tweak to your Panasonic GH3/GH4 wiring you can remotely start / stop video as well as take stills using one cable. My Sony A3000 has a regular USB micro port with 5 contacts (not 10 as other models). How can it be triggered? (at least shutter). You can use use it as presumed - for camera control via USB and/or direct triggering via 3.5 mm connector. I've never seen such a dual purpose cable for Sony, but I like the idea. 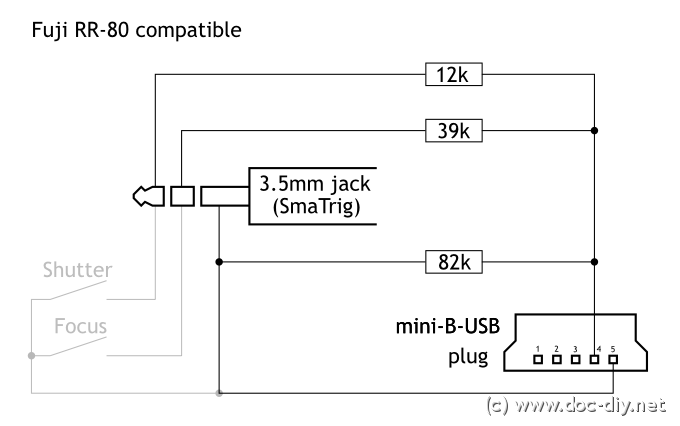 If you have the USB->Sony cable, you can try to measure which pins are used for USB. Getting the Sony plug with both options wired might be a problem. Is there a Sony Multiport adapter cable available which splits out both the USB and the wired remote shutter signals? This would allow using both a computer connection and the wired remote at the same time. There are of course cables for one or the other, but I can't find a "Y" splitter cable that provides both at the same time. Since all the signals are shared on this same one receptacle on the Sony cameras, you need such a Y cable to get both connections, unlike Canon or others that have a two separate receptacles for the wired remote versus USB. I just wanted to thank you for this valuable info. Two days ago I built the remote trigger for my camera and spent 1/10th the cost of an original one. I see alot of people looking for a tethered solution to trigger a Sony MultiPort / Multi terminal equipped camera..
We just released a solution two weeks ago, since we also were in need with our drone R&D project with a Sony MultiPort camera..
My apologies - since the last post I've done a bit of research and answered my own question - USB triggering is obviously a completely different process involving an exchange of data, rather than the simple circuit closure performed by remote cables and intervalometers. I've solved my problem by using a Raspberry Pi to communicate with the camera via USB. A bit more expensive than an MC-36, but cheaper than buying a new camera! I'm using an old Nikon D40 to do timelapse. I can trigger it remotely from my PC using the Mini-B USB socket on the camera; however, I would prefer to use a dedicated intervalometer if I can. So my question is, what is my PC doing when it triggers a shot on the D40 via USB - does it simply close a circuit, or is it supplying a more complex signal? If I knew, I could perhaps modify an MC-36 to do the same job. thanks for confirming the D7100 pinout. I do not provide the color codes since I usually reverse-engineer no-name remotes. Here the colors differ from manufaturer to manufacturer. The pinout guide you have for the Nikon D90, D3100, D3200, D3300, D5000, D7000, focus/shutter MC-DC2 connector ALSO applies to the Nikon D7100 - I know because I've got one and I have made up remote leads for it. Also, the older MC-DC1 uses a different colour code to the MC-DC2. On the MC-DC1 Nikon uses Black for ground, green for focus [red on MC-DC2] and white for shutter release. Just to confuse matters, the same FOUR core cable is used in BOTH, [red or green cut off as appropriate]. Another handy feature built into the camera is WiFi. Download the free Panasonic Image App and you have the ability to control many features remotely including start/stop video, change color profiles, set white balance, ISO, framerates, and resolution. Does anyone have an idea how the protocol or the connection diagram works for Panasonic 2,5mm Jack to control the zoom?? But there is no possibility to control the zoom. I am really freakting out because i cannot find any solutions or diagrams. Maybe somebody has an idea??? First of all, thanks for the great article! It turns out, that at least on the Sony A57,that it is only needed to connect shutter to ground, without the need of connecting focus, just as long the lens is set to MF. Of course, the correct name of the adapter cable to be \"hacked\" (see other post) is Sony VMC-AVM1, not Sony VCM-AVM1. Sony abandoned the classical 3-pin remote release port (which was found on almost all Minolta, Konica Minolta and Sony Alpha cameras since 1985 so far) in 2012. The cameras can still be released per IR remote release and be controlled via USB (tethered shooting). Since 2012 all new Sony cameras feature a USB 2.0 HighSpeed micro B connector rather than a USB mini B or a proprietary USB connector. 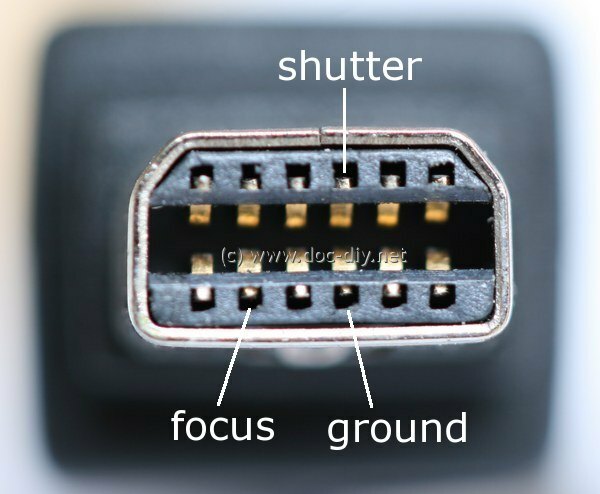 On most of these new cameras, however, the USB micro B connector is not labelled \\\\\\\"USB\\\\\\\" but \\\\\\\"Multi\\\\\\\" in order to indicate that it is a special Multi Terminal connector. Fortunately, the old 3-pin remote release interface is available here as well. While the proprietary Multi Terminal connector is not readily available, it is possible to \\\\\\\"hack\\\\\\\" a passive remote release adapter cable utilizing a (relatively cheap: 20-25 EUR) Sony VCM-AVM1 adapter cable. Not all functions may be provided by all camera models. Hello dear friends! I have done a macro rail for focus stacking. I used a 16f877 TQFP or a 16f877a TQFP, an step by step motor, etc... and a optocoupler. In my Canon Kiss X50 or 1100D is works great but in a Nikon d7000 not. Could it be a problem in voltage? The optocoupler is a PC817. Hi! Thanks this was really helpful! i have a canon 20d for long exposure times. 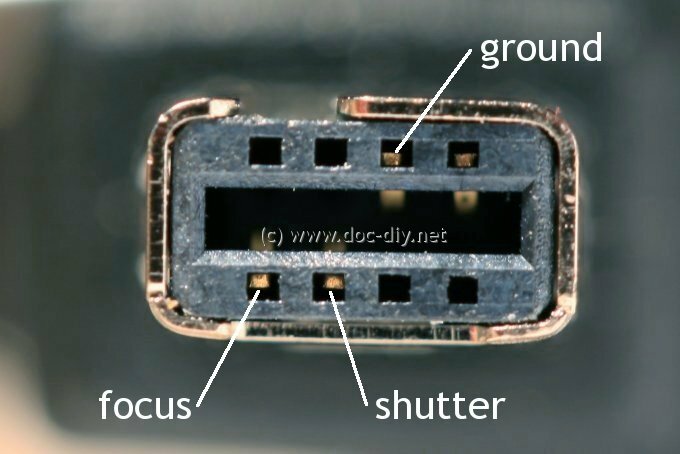 can the canon c3 plug be directly wired to laptop usb port? if so i need a schematic of the cable so i can build one. enjoy your forum. The Olympus Flash works fine with the FP-1 but Olympus does not make a cable for hooking the Flash Grip Booster to the OMD EM5 camera so the shutter release button on the FP-1 is not operational? any suggestions on a different cable or adapter?